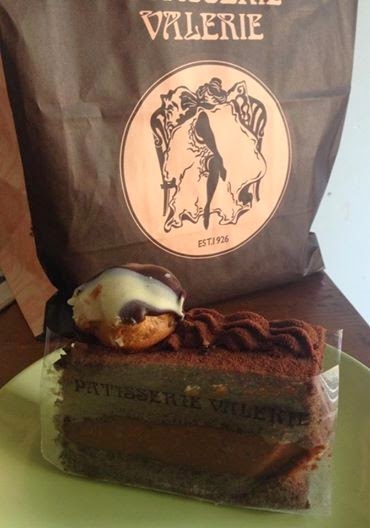 Mum of Five Staying Sane: Finally I went into Patisserie Valerie and made a purchase, it was a necessity but I apologise to my waistline! 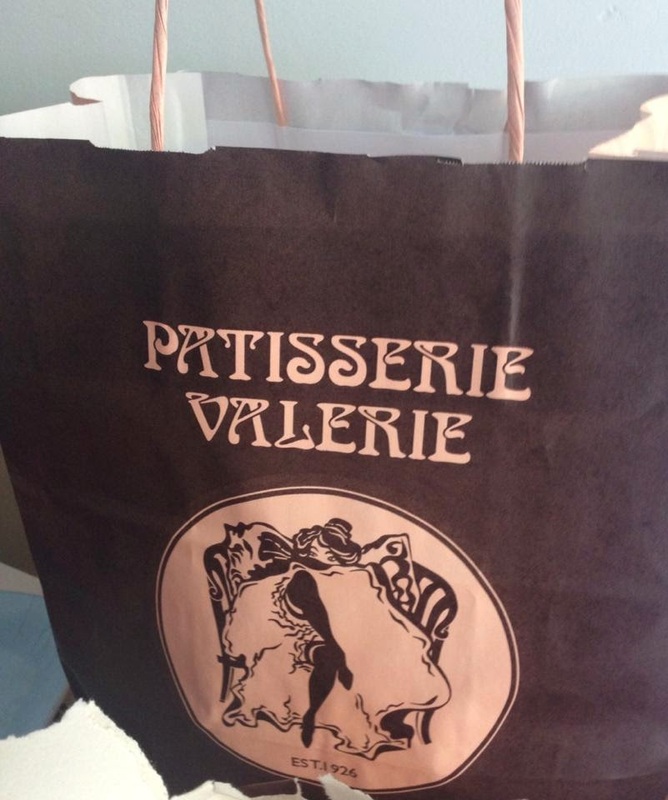 Finally I went into Patisserie Valerie and made a purchase, it was a necessity but I apologise to my waistline! I've heard about Patisserie Valerie in the past and whilst in London last year I passed a couple of their shops whilst I was in a taxi. That wasn't good and whilst walking back to Waterloo station later that day I decided I would stop at one. However, it was not to be. Could I find one on my way back to the station?! I had to get back so I had no time to stop and find my bearings in order to locate the gorgeous cakes that I had to lay my hands on. Over a year later and I finally found another store. Whilst shopping for a birthday present for my Dad, which I still haven't bought, I found it nestled on the corner of a street where I'm sure it's been for ages and I've probably never noticed. Being slightly stressed from shopping on a Saturday, having 4 children and an OH with me and still thinking that I still have 39 days until back to school I decided I needed cake. As I stood in the queue I was torn. 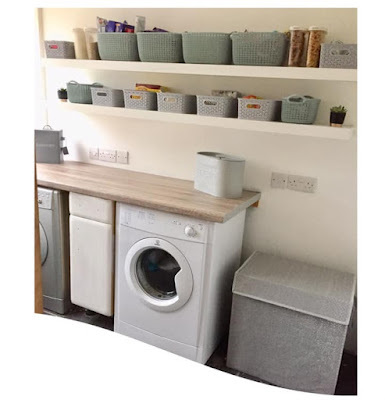 After having been to my Slimming World meeting on Wednesday myself and my friend had vowed to really get back on track with our weight loss yet at the same time the cake was calling me. They looked scrummy and I had been looking for this shop for over a year. I couldn't let the opportunity pass me by! So I made my purchase. I carefully carried them around the shops making sure they got home in one piece until I had a chance to sit in peace and devour them. I've yet to hear the peace and quiet but whilst Thing 2 and 3 were out playing I snuggled with Thing 4 in front of the Lego Movie and we shared a huge slice of double chocolate gateaux. It was extremely scrummy and I let Thing 4 have more than I did! Double chocolate gateaux with profiterole on top. Ideal for sharing with Thing 4 as we snuggled. 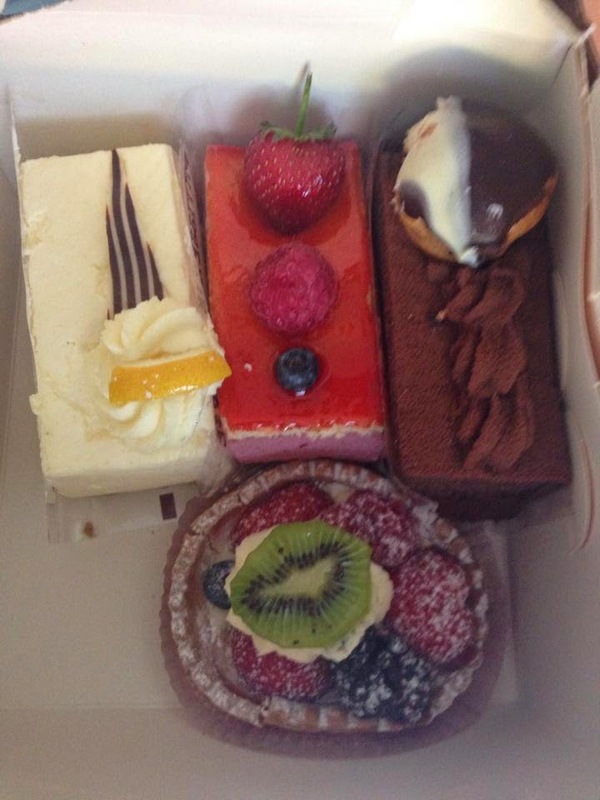 I also purchased a slice of cheesecake, a slice of strawberry mousse cake and a mixed fruit tart. I've let OH have the cheesecake as there is no way I could eat four cakes. Well actually, I could but I want the scales to be nice to me next Wednesdsy too. That means if I eat the cakes I may have to he extra good with everything else I eat and maybe exercise too, eeeek!!! From left to right; Cheescake, strawberry mousse, double chocolate and mixed fruit tart at the bottom. Let's just say that it's a good thing that this shop isn't close by as it may just be my favourite shop over the school holidays. My waistline wouldn't agree though, or my Slimming World consultant! Can't beat some good cake! I'll have to look out for Patisserie Valerie in future!